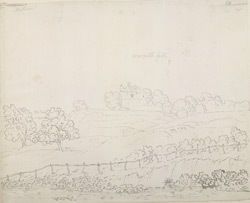 An outline view in ink of Morpeth Castle in Northumberland, from the banks of the river Wansbeck. This was the second castle built in Morpeth. The first, some 200 metres north, was destroyed in 1216 by King John and left to ruin. This one was most likely begun in the 13th century by the local de Merlay family. Maps from the early 17th century show a keep in the middle of a bailey, with a gatehouse and an outer ward. By the time Grimm made this drawing, the keep had disappeared entirely. All that remained was the gatehouse, sections of the the curtain wall, and in the outer ward a fragment of wall with two buttresses. The building was partially restored in the 19th century for the Earl of Carlisle.